Carcinoma of uterine cervix is the second most common cancers among women worldwide. Combined radiation and chemotherapy is the choice of treatment for advanced stages of the disease. The prognosis is poor, with a five-year survival rate ranging from about 20–65%, depending on stage of the disease. Therefore, genetic characterization is essential for understanding the biology and clinical heterogeneity in cervical cancer (CC). We used a genome-wide screening method – comparative genomic hybridization (CGH) to identify DNA copy number changes in 77 patients with cervical cancer. We applied categorical and survival analyses to analyze whether chromosomal changes were related to clinico-pathologic characteristics and patients survival. The CGH analysis revealed a loss of 2q33-q37 (57.1%), gain of 3q (54.5%) and chromosomal amplifications (20.77%) as frequent genetic changes. A total of 15 amplified chromosomal sites were detected in 16 cases that include 1p31, 2q32, 7q22, 8q21.2-q24, 9p22, 10q21, 10q24, 11q13, 11q21, 12q15, 14q12, 17p11.2, 17q22, 18p11.2, and 19q13.1. Recurrent amplified sites were noted at 11q13, 11q21, and 19q13.1. The genomic alterations were further evaluated for prognostic significance in CC patients, and we did not find any correlation with a number of clinical or histological parameters. The tumors harboring HPV18 exhibited higher genomic instability compared to tumors with HPV 16. This study demonstrated that 2q33-q37 deletions, 3q gains and chromosomal amplifications as characteristic changes in invasive CC. These genetic alterations will aid in the identification of novel tumor suppressor gene(s) at 2q33-q37 and oncogenes at amplified chromosomal sites. Molecular characterization of these chromosomal changes utilizing the current genomic technologies will provide new insights into the biology and clinical behavior of CC. Cervical Cancer (CC) is the second most common malignancy among women in both incidence and mortality . The HPV infection has been implicated as the most important etiologic factor in the development of CC . Although 95% of the patients with precancerous lesions harbor HPV, only a small fraction of the cases eventually progress to invasive cancer . Therefore, HPV infection alone was considered insufficient for the malignant conversion suggesting role of other genetic changes in the development of CC. Further identification of such genetic alterations is critical in our understanding of the molecular basis of CC development. Although cytogenetic studies on CC have identified a number of non-random karyotypic changes involving chromosomes 1, 3, 5, 17, and X , the search for the critical cytogenetic changes has been hampered by technical difficulties in culturing tumor cells and inherent karyotypic complexity in this tumor. Therefore, the conventional karyotype analyses have not provided definite clues on the genetic alterations involved in CC. The advent of CGH has opened a novel means of characterizing genomic imbalances in the tumor genome [5, 6]. To date, a number of CGH studies have identified chromosomal changes involving loss of 2q, 3p, 4p, 4q, 5q, 6q, 11q, 13q and 18q regions and gain of 1q, 3q, 5p and 8q at various stages of CC [7–14]. All these studies have commonly identified 3q gain, which occurred at severe dysplasia/carcinoma-in-situ leading to a suggestion that this genetic aberration plays a pivotal role in the transition from dysplasia to invasive CC . A number of molecular genetic studies also have been attempted to define the genetic alterations and found frequent LOH at 3p, 4p, 4q, 5p, 6p, 6q, 11q and 17p chromosomal regions suggesting the presence of putative tumor suppressor genes on these chromosomes [4, 15–19]. Despite this cytogenetic and molecular characterization of cervical precancerous and cancerous lesions, the genetic basis of CC development and progression remains poorly understood. Here we report CGH characterization of chromosome copy number alterations on a panel consists of 77 CC and we identified 2q33-q37 deletions, 3q gains and chromosomal amplifications as the frequent genetic changes. A total of 77 tumor tissues were obtained from patients treated at the Instituto Nacional de Cancerologia, Bogota, Colombia and the Department of Obstetrics and Gynecology of Friedrich Schiller University, Jena, Germany. Of these, 5 were diagnosed as adenocarcinoma and the remaining 72 were as squamous cell carcinoma. Based on the International Federation of Gynecology and Obstetrics (FIGO) criteria, the tumors classified as 14 stage IB, 18 stage IIB, 42 stage IIIB, and three stage IVB patients. All the tumors were positive for high-risk HPV types, except two (CC81 and CC148). All the biopsies were estimated to contain more than 60% of tumor cells. Clinical information such as age, stage and size of the tumor, follow-up data after treatment was collected from the review of institutional medical records, and by contacting outside physicians and institutions. All 77 tumors were followed up between one to 72 months after treatment. HPV types were identified as described earlier . High-molecular weight DNA was isolated from frozen tumors and normal placenta by standard methods. The CGH was performed as described previously . Briefly, the tumor and normal DNAs were labeled by nick-translation with fluorescein-12-dUTP and Texas Red-5-dUTP (NEN-DuPont, Boston, MA), respectively. Equal amounts of tumor and normal DNA were co-precipitated along with human Cot-1 DNA (GIBCO/BRL, Gaithersburg, MD) and re-suspended in the hybridization buffer before hybridization to metaphase chromosomes prepared from phytohemagglutinin-stimulated lymphocyte cultures from normal individuals. Upon hybridization, the chromosomes were counter-stained with DAPI to allow their identification. Seven to 10 metaphases were captured for each case using a cooled charge-coupled device (CCD) camera attached to a Nikon Eclipse 800 microscope. The metaphase preparations were processed using the Quantitative Image Processing System (Applied Imaging, Santa Clara, CA). Red, green, and blue fluorescence intensities were analyzed for all metaphases, normalized to a standard length, and statistically combined to show the red:green signal ratio and 95% confidence intervals for the entire chromosome. Copy number changes were detected based on the variance of the red: green ratio profile from the standard of 1. Ratio values of 1.20 and 0.80 were used as upper and lower thresholds to define gains and losses, respectively. High-level amplification was defined as occurrence of fluorescein intensity values in excess of 2.0 along with a strong localized FITC (fluorescein isothiocynate) signal at the chromosomal site. For assignment of high-level amplification to a chromosomal band, the peak ratio profiles were compared to the corresponding DAPI banding of individual chromosomes. We used categorical and survival analyses to analyze whether chromosomal changes were related to clinico-pathologic characteristics and patients survival. We first categorized chromosomal changes into any amplification, loss of 2q, 3q gain, and individual gains and losses. The associations between these changes and different clinico-pathologic characteristics including histological type, stage, size of the tumor, patient's age, HPV type, and treatment response were assessed through Chi-Square  and Fisher's Exact tests . Given the number of comparisons that we made, all p values were adjusted for multiple comparisons using The False Discovery Rate method . Total losses, total gains, and total changes identified in all chromosomes were treated as continuous variables and Analysis of Variance was performed to compare the mean losses, gains and changes among different clinico-pathologic groups . Cox Proportional Hazard Models were further applied to assess the relative hazard (risk) of dying associated with chromosomal changes after adjusting for subject's age at diagnosis, stage and size of the tumor and HPV type . Genomic DNA from 77 primary cervical carcinomas was subjected to CGH to identify chromosomal copy number changes. We previously reported CGH data on 44 primary tumors and the remaining 33 cases were added to this study . Seventy-five of the 77 (97.4%) tumors were positive for HPV DNA. The remaining two tumors were HPV negative. HPV16 was found in 45 (60%) tumors, HPV18 in 4 (5.3%), while multiple HPV infections and other types of HPV were found in 26 (34.7%) tumors (Table 3). Under representation of DNA copy number (>25%) was noted at seven chromosomal regions: 2q (57.1%), 13q (42.9%), 4q (36.4%), 11q (36.4%), 4p (29.9%), 17p (29.9%), and 3p (28.6%). Chromosomal gains (>15%) were identified in 11 chromosomal arms: 3q (54.5%), 5p (29.9%), 1p (27.3%), 8q (26%), 20q (26%), 9q (24.7%), 1q (19.5%), 20p (18.2%), Xq (16.9%), 19p (16.9%), and 13q (15.6%) (Figure 1). The common regions of deletions on chromosomes 2q were mapped to 2q22-q33 and 2q36-q37, 13q deletions at 13q12-q13 and 13q22-q34, and 11q deletions at 11q23-q25. The common region of gained sites was identified for 8q at 8q23-q24, 1p at 1p32-p36, and for 13q at 13q22-q34. Ideogram showing DNA copy number changes identified by CGH in 77 primary CC. Thin vertical lines on either side of the ideogram indicate losses (red) and gains (green) of chromosomal region. 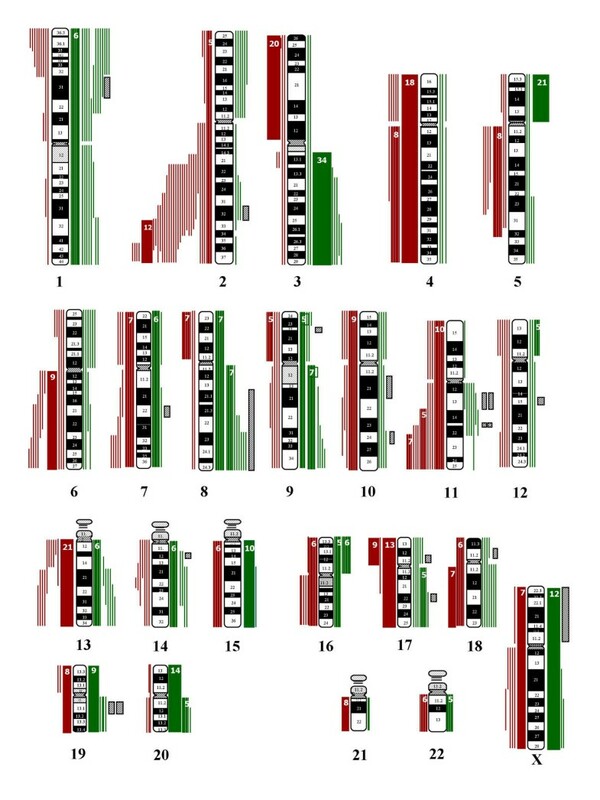 The chromosomal regions of the high level amplification were shown in thick lines (right). Total number of the same chromosomal aberration was shown as number next to the ideogram. A very striking observation in the present study was the loss of 2q in 57.1% of CC. The common regions of deletions were mapped to 2q22-q33 and 2q36q37 regions. Previous CGH and LOH studies have noted low frequency of genetic losses at 2q in precancerous lesions, carcinoma-in-situ, and invasive CC [8, 9, 12, 15]. This might be due to limited number of tumors analyzed and lack of systematic analysis. This region also affected by the deletion in a number of other tumor types and has been shown to predict poor prognosis at the advanced stages of disease . Our extensive LOH analysis of 2q35-q37.1 regions has identified two distinct minimal deletions at 2q35-q36.1 and 2q36.3-q37.1 in precancerous and invasive lesions . A number of genes (CFLAR, CASP10 and PPP1R7) mapped to these regions were found to be down regulated and this down-regulation was reactivated upon exposure to demethylating and histone deacetylase inhibiting agents. These data suggest that both genetic epigenetic changes play a role in 2q alterations [25, 27]. Thus, the identification of high incidence of 2q33-q36 losses in CC strongly suggests that this region harbor one or more tumor suppressor genes. Other frequently deleted chromosomal regions that we have identified, such as 3p, 4p, 4q, 11q, and 17p, also have been previously reported to contain high frequency of LOH [15, 16, 27, 28]. Of the DNA copy number gains seen in CC, the 3q exhibited highest frequency in 54.5% of tumors. Although most tumors showed complete 3q gain, a common region of gain mapped to 3q26-q29, which is identical to previously reported studies [7, 8]. In CC, the gain of 3q has been shown to associate with progression from high grade CIN to invasive cancer . A number of studies have identified candidate genes on 3q26-q27 regions. The PIK3CA, which encodes a catalytic subunit of phosphatidylinsitol 3-kinase, has been implicated as a candidate oncogene at 3q26 in carcinomas of cervix, ovary and head and neck [29–31]. Although other genes such as eIF-5A2 and CCNL1 have been recently implicated as candidate oncogenes of 3q amplification, it is still unclear regarding the target of amplified genes on 3q [32, 33]. We identified 18 high-level chromosomal amplifications at 15 different chromosomal sites in 16 of 77 (20.77%) cases studied. The amplifications were noted at 1p31, 2q32, 7q22, 8q21.2-q24, 9p22, 10q21, 10q24, 11q13, 11q21, 12q15, 14q12, 17p11.2, 17q22, 18p11.2, and 19q13.1 (Figure 2). Recurrent sites of amplification were noted in 3 chromosomal sites at 11q13 (CC52 and T-130), 11q21 (CC98 and CC117), and 19q13.1 (T-132 and T-146). Chromosomal amplifications identified by CGH in CC. 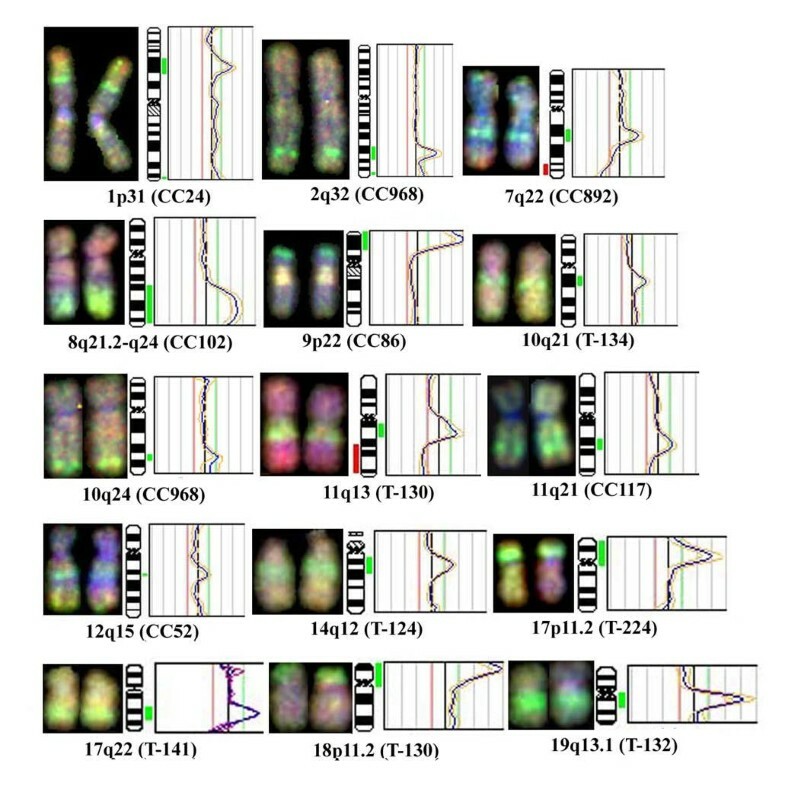 Partial CGH karyotypes (left) and corresponding ratio profiles (right) illustrating 15 amplified chromosomal regions in CC. The blue line in the ratio profiles represents the mean of 8 to 10 chromosomes, and the yellow lines indicate the standard deviation. The vertical red and green bars on the left and right of the ideogram indicate threshold values of 0.80 and 1.20 for loss and gain, respectively. A threshold value of 2.0 or more indicates amplifications. Increase in gene dosage by DNA amplification is a common mechanism to achieve over-expression of genes in tumors. Gene amplification has been shown to commonly associate with tumor progression, chemotherapy resistance and clinical outcome in a variety of tumor types . The CGH technology has particularly aided in identifying amplifications of chromosomal loci and the subsequent identification of the target genes in a number of tumor types [5, 6]. However, the scope of gene and chromosomal amplifications has been limited in CC. In the present study, we identified a very high frequency of amplified chromosomal sites in CC. We have previously reported similar high frequency of chromosomal amplifications in 7 of 8 CC cell lines . Several of these sites are of interest namely 8q24, which harbor the MYC gene and was previously shown as a candidate amplified gene in CC by Southern blot analysis . A recently identified protein tyrosine phosphatase (PRL-3) gene also maps to 8q24 and was shown to express at high levels in metastatic colon cancer . Also WISP, a member of the family of cysteine-rich, glycosylated signaling proteins that mediate cell proliferation, adhesion, cell polarity and cell fate, maps to 8q24 and has been shown to over-express in colon cancer . The amplified CCND1/PRAD1 gene on 11q13 has been shown to be over expressed in CC cell lines . Thus, the identification of a number of chromosomal regions of amplification in the present study suggests that the gene amplification is a common genetic alteration in invasive CC. Further molecular characterization of the amplified regions should facilitate the identification of the target amplified genes in CC. The clinical behavior of the CC is highly unpredictable. There are currently no molecular genetic markers of outcome used for CC that distinguishes tumor in terms of its treatment response. In the present study we found a number of non-random genetic changes in invasive CC. We made an attempt to correlate the genetic losses, gains and amplifications with clinico-pathologic features such as age, stage and size of the tumor, clinical outcome, and HPV type (Table 1 & Table 2). P value corresponds to the P value from Chi-Square test, or from the Fisher's Exact test (where appropriate). ‡ ORs are adjusted for age, stage, size of the tumor and HPV type § ORs are additionally adjusted for any amplification, losses of 2q and gains of 3q. ¶ ORs are additionally adjusted for total losses and total gains. The total number of genetic changes combining losses and gains together, total gains alone, total losses alone, and individual gains and losses showing in >15% cases, and chromosomal amplifications were subjected to univariate analysis examining the associations. No correlation was found with any of the parameters examined, except HPV18 (Table 1). The patients that had HPV18 infection showed higher frequency of chromosomal amplifications (75% in HPV18 vs. 16.9% in other HPV types), total losses (10.00 ± 5.48 in HPV18 vs. 4.62 ± 3.49 in HPV 16) and gains (8.75 ± 6.06 in HPV18 vs. 3.33 ± 2.85 in HPV 16) and total changes (18.75 ± 11.53 in HPV18 vs. 7.96 ± 5.68 in HPV 16) (Table 1). The association of genomic instability represented by chromosomal amplification and copy number changes with HPV18 infection is interesting in the light of the oncogenic potential of this HPV type. HPV18 is known to cause rapid transition to malignancy and HPV18-infected tumors are generally more aggressive . However, the number of tumors with HPV18 infection in the present study was small to come to any definite conclusions. While we found a number of different genetic changes in our large study of CC, these changes were not statistically significantly associated with clinico-pathologic criteria except for HPV type. Whether the presence of HPV type influences unique genetic changes needs to be further explored in a larger study. Given that most CC arises in women with HPV infection but most women with HPV infection do not develop CC, uncovering genetic changes unique to HPV type are critical in understanding CC etiology. Studies aimed at elucidating the cellular mechanisms involved in genomic instability in relation to HPV18 may better our understanding the underlying biological pathways of oncogenic potential of HPV 18. Contrary to the existing dogma [36, 41], the CC patients with amplification did not show significant correlation with disease outcome in the present study (Table 1). Furthermore, multivariate survival analysis after adjusting for age, stage, size of the tumor, and HPV type also did not show any statistically significant relation to survival (Table 2). A number of previous studies have shown prognostic value of genomic alterations in CC such as loss of 11p and 18q and over expression of EGFR with poor prognosis, and 9p loss with metastasis [9, 41]. However, there were no reports available on the chromosome amplification in relation to prognosis in CC. Gene amplification, in general, has been shown to predict poor prognosis . However, only few oncogenes have emerged clearly as indicators of patient prognosis, such as MYCN in neuroblastoma and ERBB2 in breast cancer . Although the chromosomal amplifications identified in the present study did not predict worse outcome, our work provided the first evidence towards identifying specific gene(s) at amplified chromosomal sites that may have clinical importance in predicting treatment response. In summary, the present study demonstrated that 2q33-q37 deletions, 3q gains and chromosomal amplifications as characteristic changes in invasive CC. The genetic alterations reported here have the potential to uncover novel tumor suppressor gene(s) at 2q33-q37 and oncogenes at amplified chromosomal sites. Molecular characterization of these chromosomal changes utilizing the new genomic technologies should provide important clues of the genetic mechanisms of initiation and progression, and provide new insights into the clinical behavior and management of CC. Supported by a grants from National Institutes of Health (CA095647), Elaine B. Lesser Foundation and EIF pilot award from Herbert Irving Comprehensive Cancer Center, Columbia University (V.V.V.S.M) and a grant from Colciencias, Colombia (H.A.P). PHR has planned and supervised the entire study. X-YL and CPH were involved with comparative genomic hybridization experiments and data analysis. HA-P, HV and AS assisted in tumor sample collection, HPV typing and clinical information of the patients. The statistical analysis was done by FFZ and MBT. GN has contributed towards the data management. VVSM was involved in the planning, and organization of the project.